The P600 from Pirelli really pushes the envelope of performance. 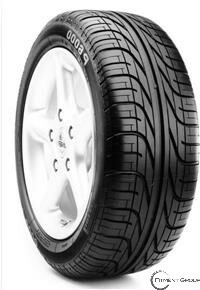 The Pirelli P600 has a patented new wave tread that is extremely innovative and that provides a lot of features and benefits to anyone choosing these tires. The tread design of the Pirelli P600 is very innovative with a tread block that is almost continuous that runs from the tires center to its shoulder. This tread block provides the feature of exceptional stability to the tire which has a lot of benefits to the driver. The tread block running from the center to the shoulder is separated by water clearing channels that are elliptical and that run across the area of the tread. The tread design was developed in experiments run in CAD and CAM. With the tread design on the Pirelli P600 tread block stability is combined with noise reduction and safety during wet weather. The tire is made from a mix of silica, black fillers and synthetic polymers which provide the tire with a high level of wet grip and also exceptional low rolling resistance. The casing of the tire has also been designed to improve the functionality of the tire. They do this by reducing weight and thus amplify the attributes and benefits offered by the compound combination and new tread pattern.